Beautiful instruments inspire beautiful music. The sound and feel of a hand-made instrument can bring out the very best in your playing. Why hold yourself back? 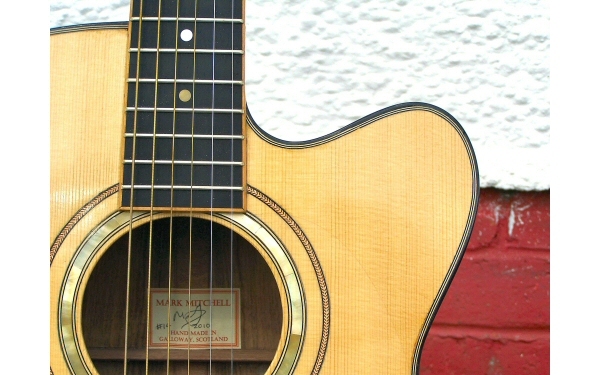 Most of the big name manufacturers offer custom models, so why would you want a bespoke guitar? The truth is, those custom jobs are little more than your choice of wood and decoration applied to their standard models. 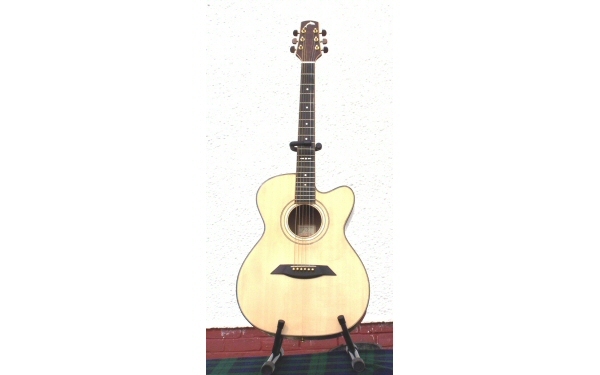 You get an instrument that looks nice, but in terms of sound and playability is no different to its cheaper sisters. With a bespoke instrument you can be involved at every stage, from choosing the body size and shape (design your own if you want!) right down to the little details like neck profile and fingerboard radius. And, most importantly, the soundboard graduation and bracing can be tailored to give you the sound you’ve been dreaming of. All this for about the same price as a good Martin or Taylor. I’m an old fashioned luthier, I like to use traditional materials and techniques. I work wood with hand tools – planes, chisels, spokeshaves and cabinet scrapers. The only places I routinely use machine tools are for sawing and drilling. It’s not a matter of principle, I am happy to embrace new techniques IF they result in a better end product. But the vast majority of modern techniques are aimed not at improving the product, but at reducing production time or de-skilling the job. When I compare the deep sheen of a piece of spruce finished by plane with the dull lifelessness of a piece that’s been sanded, I’ll continue to finish my soundboards with plane and scraper, regardless of the extra time it takes. Many of the guitar making techniques commonly used today were developed by the likes of Gibson and Martin in the early 20th century. But those guys were mass producing guitars, and those innovations were almost always aimed at reducing production time and worker skill levels. Other makers have copied their techniques, without really thinking about why they do it that way. For instance, most makers today use a solid mould to make the body. The mould itself takes a significant amount of time to make, but once done you can make hundreds of guitars on it. That’s great for a factory. But for a small producer, every time you want to build a different body shape you have to make a new mould. So I don’t use a solid mould, I use the traditional Spanish method of building on a solara or building board. It takes a bit more skill and precision, but it means.I’m not limited to a few standard body shapes, I can make any shape you like with no extra effort or cost. Joining the neck to the body is probably the most crucial operation in making a guitar. Every manufacturer has their own ideas as to how it should be done – from the complex dovetail joint through various types of tenon joint to bolt on systems. None is ideal. But why have a neck joint at all? The only reason is so that necks can be made in one part of the factory and bodies somewhere else. That’s hardly relevant to a small workshop maker, so I don’t use a neck joint. Instead I use a traditional Spanish slipper heel, where the neck and internal block are all one piece of wood, and the body is built directly onto the neck, giving perfect alignment every time. And no neck joint means there is nothing to move or break, so you won’t need a costly neck reset further down the line. This is where the luthier’s skill really comes into its own, and it explains why hand made guitars inevitably sound louder and clearer than their factory built cousins. The soundboard of a stringed instrument works in the same way as a loudspeaker. If you look at the construction of a speaker it has a stiff cone, suspended on a flexible rubber ring at the rim. So when it is energized the whole cone moves. displacing a lot of air and making a lot of sound. And that is exactly what we need from a soundboard – it needs to be stiff in the middle but flexible round the edges, so that when the bridge vibrates, the whole soundboard goes with it. To achieve that the soundboard needs to be made thicker in the middle and thinner around the edges (graduated). Exactly how thick or thin depends on a number of factors, including the tonal qualities you are trying to achieve and the stiffness and density of the individual piece of wood. It’s not something that can be done by following dimensions on a plan or copying an existing instrument, it involves feeling the wood, and listening to the tone it produces when tapped. Unfortunately there isn’t a machine that can graduate soundboards, so in all but the best factory guitars the soundboard is simply put through a machine that sands it to a uniform thickness. 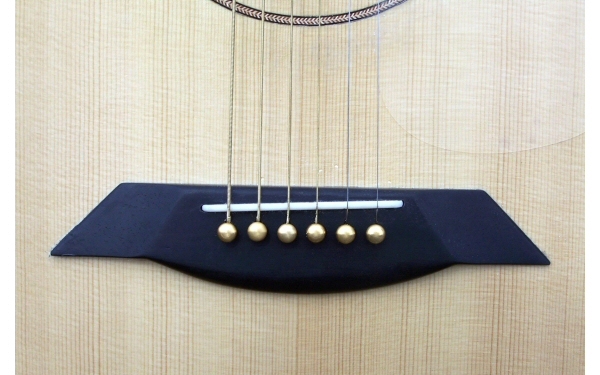 A few manufacturers use tricks like routing a channel round the underside of the soundboard to approximate to graduation, but still no allowance is made for the stiffness or flexibility of the individual piece of wood. Bracing is a necessary evil. It is essential to make the soundboard strong enough to withstand the tension of the strings, but it inevitably compromises the sound of the instrument. The trick is to make it as light as possible whilst still strong enough to stop the soundboard collapsing. The luthier can fix the bars to the soundboard, then carve them away to achieve just the right degree of stiffness. In factory guitars the bracing is always made far stronger than it needs to be so that there is no fear of the soundboard ever collapsing, but at the expense of volume and tone. 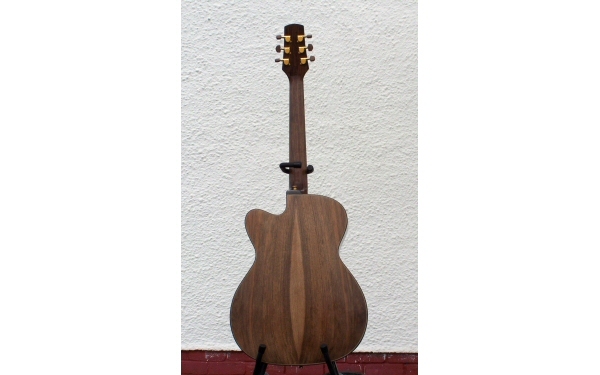 The finish on a guitar has more effect on the tone than the choice of wood for the back and sides. A thick layer of lacquer dampens the sound in much the same way that sticking carpet all over the instrument would. Because of that my preferred finishing method is traditional french polishing with a mixture of shellac and sandarac resins. French polishing take considerably longer than spray finishing, but the end result is a finish that is a fraction of the thickness of sprayed lacquer. Some manufacturers boast about how thin their lacquer is, but if you look at one of their instruments that has got chipped you can see that the lacquer is still several times thicker than a typical french polish. It has to be, because when you spray, each coat has to be thick enough that you can sand it down without fear of rubbing right through to bare wood. The other factor that I think is important is the feel of the instrument in your hand – there is something very tactile about french polish, it feels warm and natural, whereas lacquers feel cold and plasticky. However french polish does have its disadvantages: it is more fragile than lacquer, and will eventually wear through at high contact points such as the neck, and it is vulnerable to water and alcohol damage. If you spill your whisky on a french polished guitar the finish will be ruined. That is to some extent offset by the fact that french polish is very much easier than lacquer to touch up, repair or refinish. But for instruments that are going to lead a hard life on the road lacquer might be a better choice, and I am quite happy to spray lacquer your instrument if that is what you prefer.